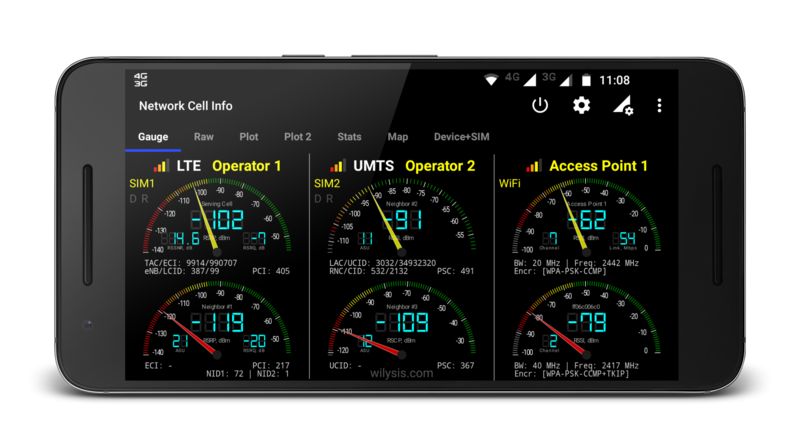 The ultimate network cell signal information tool (only for Android devices). 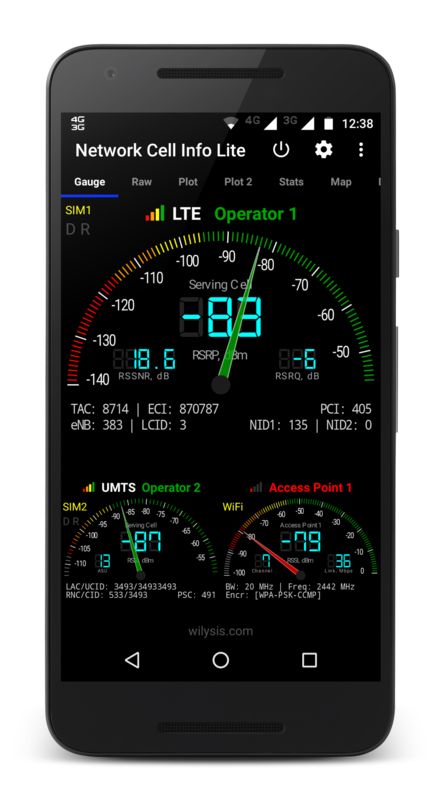 Network Cell Info is a cell network monitor and measurements log tool (4G+, LTE, CDMA, WCDMA, GSM). It provides also WiFi info (beta). Data accuracy is dependent on device implementation of Android APIs. Not all manufacturers/devices implement fully/correctly Android APIs. For Android < 5.0, Dual SIM is not supported for non-MediaTek devices, due to Android/device limitation. GPS: It is highly recommended, for best app performance, to set the GPS mode to "high accuracy" in the location settings of your device. MAP Cell Location: We don't have own database for cell locations. We use currently the MLS database, which returns not the actual cell tower location, but roughly an indication of the cell locations. You may use Mozilla Stumbler app, to update the Mozilla MLS database in your area. (**) xARFCN, Band, Fc, for Android 7+ devices implementing well the corresponding Android API 17+ telephony functions. FAQ: https://goo.gl/EhDDVx - also available inside the app settings / about. 1. If Google Play hangs while installing the app, reboot your device. 1. Update app to latest Release. 2. Uninstall the app, (reboot the device,) and re-install. 3. Perform any pending system and/or google apps update(s), and re-install the app. 4. If your Android/ROM/root somehow modifies the apk, then the app will not work. 5. Turn the internet on, before you start the app for first time (or after long time). 6. Email us to help you! 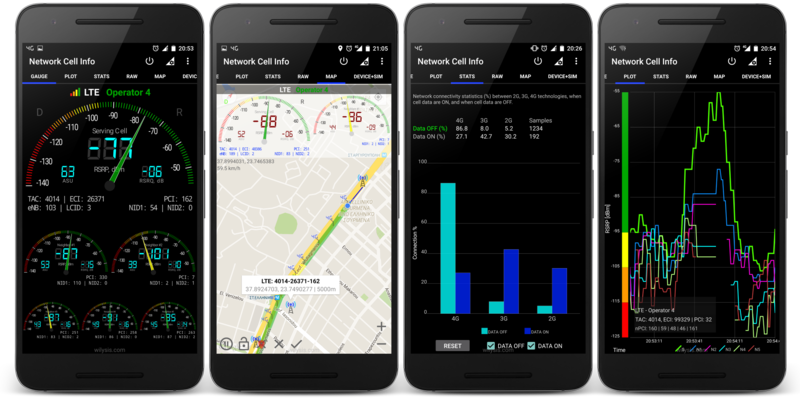 In the following, we explain the differences between Network Cell Info Lite, Network Cell Info (core), and Network Cell Info with 1-yr Pro features subscription. The Pro features subscription, introduces new features/development first published in Release 4.0. Please find the Manual available in PDF format, and also in the YouTube video below. Here you can find the Frequently asked questions, which help identify any issues/questions you might have with the app (they are also available in the app, under the app settings / about). Network Cell Info has the capability of exporting the measurements taken in different database formats. Exporting happens by pressing the checkmark button in the Map Tab of the app. The common formats are 6 and shown below, and also there are 2 formats available only in the Pro subscription of the paid app. In the app, you can choose the database format by going to the app settings -> database. Network Cell Info has the capability of exporting the measurements taken in different database formats. Exporting happens by pressing the checkmark button in the Map Tab of the app. The common formats are 6, and also there are 2 formats available only in the Pro subscription of the paid app, which are explained below. Participate in (pre-release) Beta Lite testing! Participating in our Beta-release version (or leaving from it, and get back to the latest product-release), is very easy as explained below. Participate in (pre-release) Beta testing! Participating in our Beta-release Full version (or leaving from it, and get back to the latest product-release), is very easy as explained below (for users having purchased the full Network Cell Info app).